Amid continued demonstrations, Ibn Auf’s resigned on Friday evening, and named Lieutenant General Abdel Fattah al-Burhan as his successor. 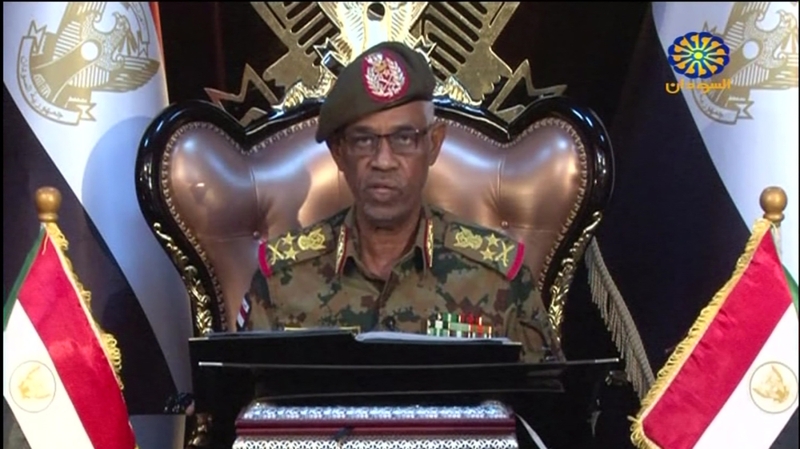 General Mohamed Hamdan Dagalo, known by his nickname Hemeti, is being appointed the deputy leader of the ruling military council, according to Sudanese state television. Footage shows Hemeti, who commands the paramilitary Rapid Support Force, being sworn in. Omar al-Digair, head of a 10-member delegation representing anti-government protesters, says the group “delivered our demands to the military council” including the formation of a civilian-led transitional government. 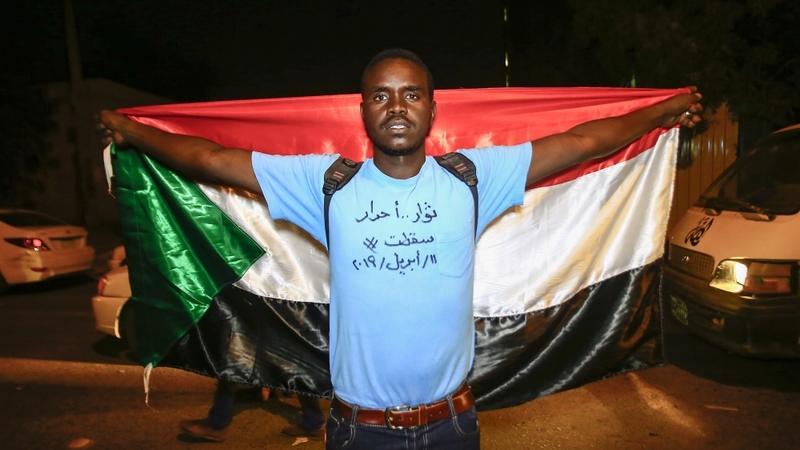 Speaking outside the army headquarters in Khartoum, he says the delegation called for the release of some 47 students of Darfur origin who were arrested in December as well as the reforms to the security services. The National Congress Party is urging the ruling military council to release its acting president and other key members. “We consider the military council’s power grab a violation of constitutional law,” the party says in a statement. 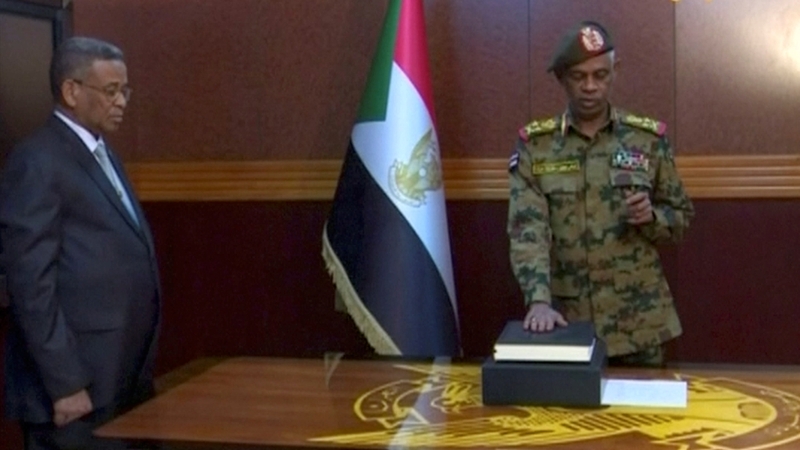 A 10-member delegation representing groups behind the months-long anti-government demonstrations is holding talks with Sudan’s military council at the army headquarters in Khartoum. The meeting comes as the new head of the council calls for dialogue and vows that a transitional period will last a maximum of two years. The new head of the military council says those involved in the killing of protesters will face justice and orders the release of prisoners jailed under emergency laws. “I announce the restructuring of state institutions according to the law and pledge to fight corruption and uproot the regime and its symbols,” al-Burhan adds in his first televised address to the nation. Sudan’s military council says a civilian government will be formed after a transitional period that will last for a maximum of two years. The new leader of Sudan’s military transitional council has announced the lifting of the curfew imposed his predecessors. The head of Sudan’s National Intelligence and Security Service, Salih Ghosh, has resigned from his post, the country’s new military rulers said on Saturday. 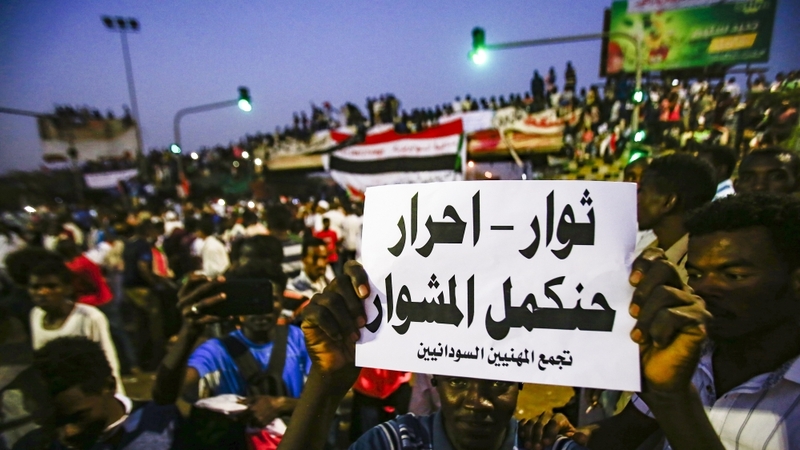 The Sudanese Professionals Association (SPA), which spearheaded the months-long demonstrations that triggered al-Bashir’s overthrow, praises Ibn Auf’s departure as a “triumph of the will of the masses”. The group also calls on people to continue a sit-in outside the army headquarters in the capital and take to the streets outside the military’s “various garrisons” elsewhere throughout the country. Protesters in Khartoum, meanwhile, tell Al Jazeera the toppling of al-Bashir and resignation of Ibn Auf within 36 hours is the result of “patience, sacrifices and struggle for four months”. “We now want to witness the power being handed over to the civilians, this is the … democracy and freedom we aimed to achieve,” Abdul Jabar Ibrahim, 60, says. General Awad Ibn Auf announces he is stepping down as head of the ruling military council. “I, the head of the military council, announce I am giving up the post,” Ibn Auf says in a speech broadcast live on state television. He says he is taking the decision to preserve the unity of the armed forces. Al-Burhan will now head the transitional council, he says. 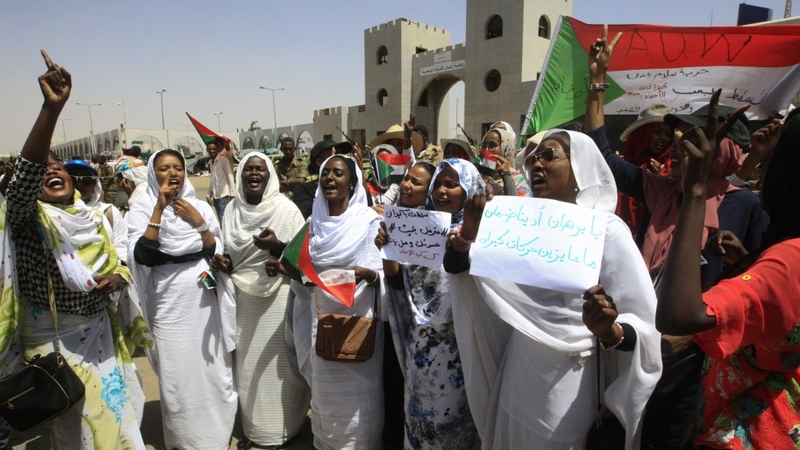 Christoph Heusgen, president of the UN Security Council, says members agreed to monitor the situation in Sudan following a closed-door briefing. While the 15-member body is not announcing any action on Sudan, Heusgen, who is also Germany’s ambassador to the UN, tells reporters the body understands the meeting “as a strong signal that the Security Council is dealing with the issue”. Sudan’s military council is asking all “political forces” in the country to name two representatives by Saturday for a dialogue on the country’s transition. The council says a time for the meeting will be set once it has received the names from all groups, according to SUNA news agency. 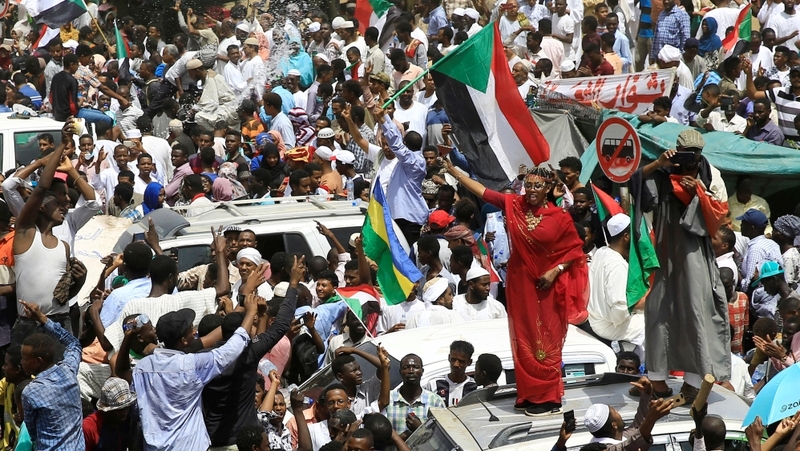 Sudan’s envoy to the United Nations says that a two-year transition period to civilian rule could be shortened “depending on developments on the ground and agreements between stakeholders”. 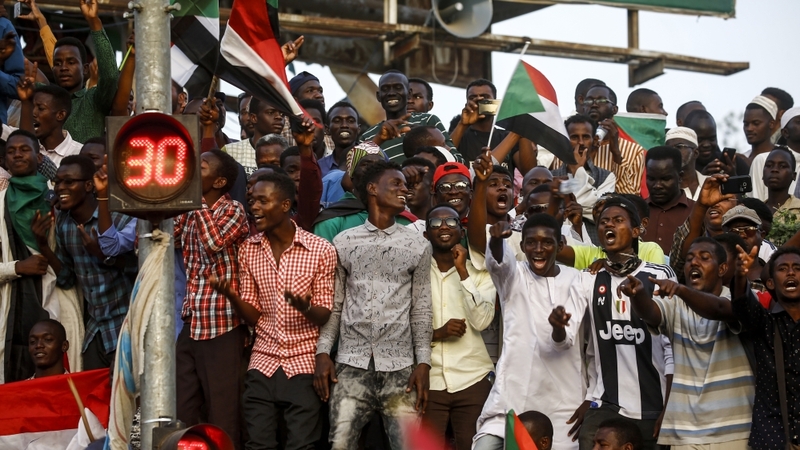 “The [military] council will be the guarantor of a civilian government to be formed in collaboration with political forces and stakeholders,” says Yasir Abdelsalam, Sudan’s charge d’affaires. “No party will be excluded,” he adds. Tens of thousands of protesters are rallying outside the army headquarters in the capital, calling for the military council to immediately hand over power to a civilian-led transitional government. Protesters say they will not leave the rally until Ibn Auf steps down. “What is happening now is a big trick; this is the same regime of al-Bashir and so they want to cheat us in order to maintain the interests of the ruling party seniors, the security organs and the entire regime symbols,” protester Mohamed al-Zain tells Al Jazeera. Al Jazeera’s Hiba Morgan, reporting from Khartoum, says the military council’s declaration does not seem to be “selling with the thousands of people who are out on the streets” protesting. “This is not what they have been asking for,” Morgan says, adding that protesters want a hand over of power to an “interim, independent civilian government”. “They [the protesters] do not want the military to be taking charge of affairs until elections are held,” she adds. The Sudanese Professionals Association (SPA) dismisses the ruling military council’s claim it had no ambitions to hold on to power in Sudan. Denouncing the military statement as a “farce”, the SPA calls for an immediate handover of power to a civilian transitional government. The commander of Sudan’s Rapid Support Force (RSF), a paramilitary group, says it will not “accept any solutions rejected by the Sudanese people” and calls for the country’s military to start “opening the door for dialogue” with protesters. Mohamed Hamdan Dagalo, known as Hemeti, says in a statement talks are needed to prevent Sudan from “slipping into chaos”. Michelle Bachelet, United Nations High Commissioner for Human Rights, says she is “closely monitoring developments” in Sudan and calls on authorities in the country to “refrain from using force against peaceful protestors”. Bachelet also urges authorities to release all those detained for “their exercise of the freedom of peaceful assembly and expression” while protesting. “The crisis in Sudan has its roots in human rights grievances – economic, social, civil and political rights. The solution must also be grounded in human rights,” Bachelet says. Germany’s foreign ministry is calling for a peaceful solution to the crisis in Sudan following al-Bashir’s removal. 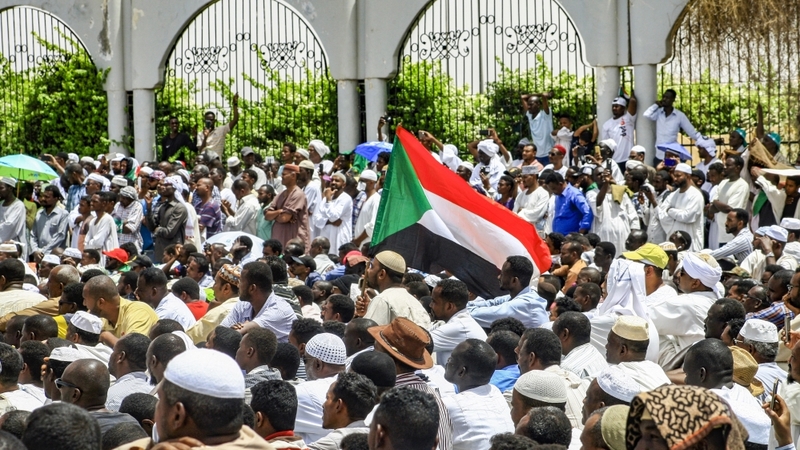 “We are calling on all sides to exercise restraint, as we need a peaceful solution to the crisis, which fulfils the expectation of the Sudanese people for a political change,” says Christofer Burger, deputy spokesman for the German foreign ministry. “It is important that the protests can proceed peacefully, and any use of violence against demonstrators is not acceptable,” he adds. 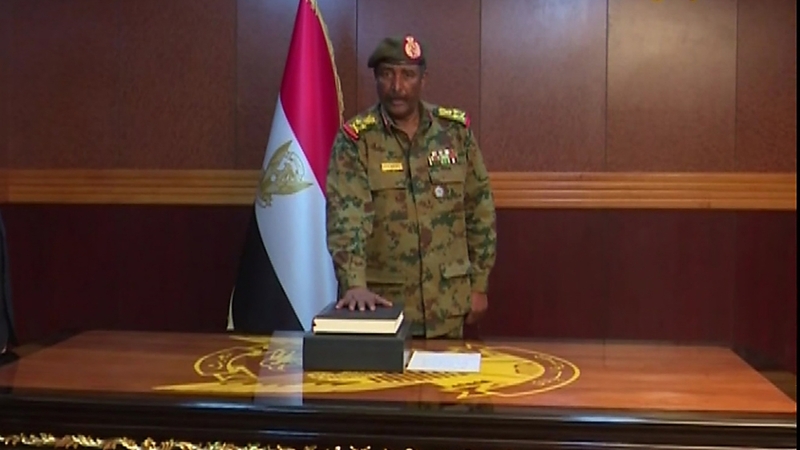 Omar Zein al-Abideen, member of military council, says Sudan will not extradite al-Bashir to the International Criminal Court (ICC) to face trial on charges of genocide. He says the former president will instead be tried and judged in Sudan. Al-Bashir, who is sought by the ICC for war crimes in Sudan’s Darfur region, is currently being held in an undisclosed prison, he says. “We have our own judiciary … We will not extradite any Sudanese citizens. It’s a dark spot in our history if we extradite him,” al-Abideen says. 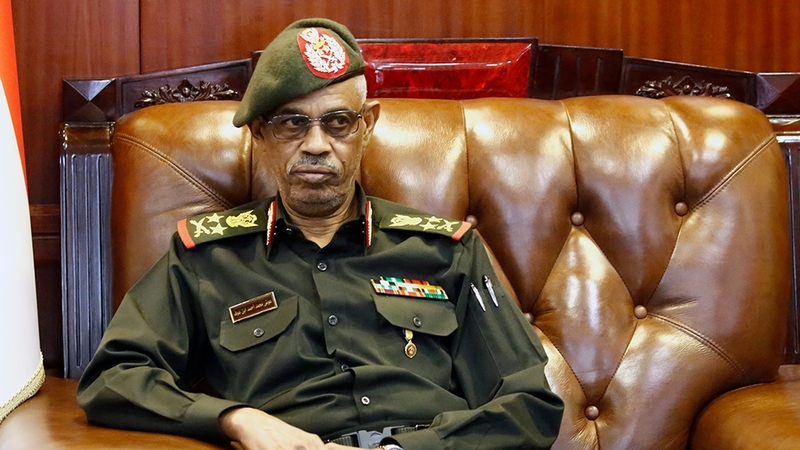 The head of Sudan’s provisional military political council says the army has “no ambition to hold the reins of power”, stressing “we are ready to step down as early as a month if a government is formed”. Addressing a news conference in the capital, Khartoum, Omar Zein al-Abideen says that the two-year transition period can be as short as one month if managed “without chaos”. It was the man named by al-Bashir as his deputy just six weeks ago who broke the news to the Sudanese people of the longtime ruler’s removal. 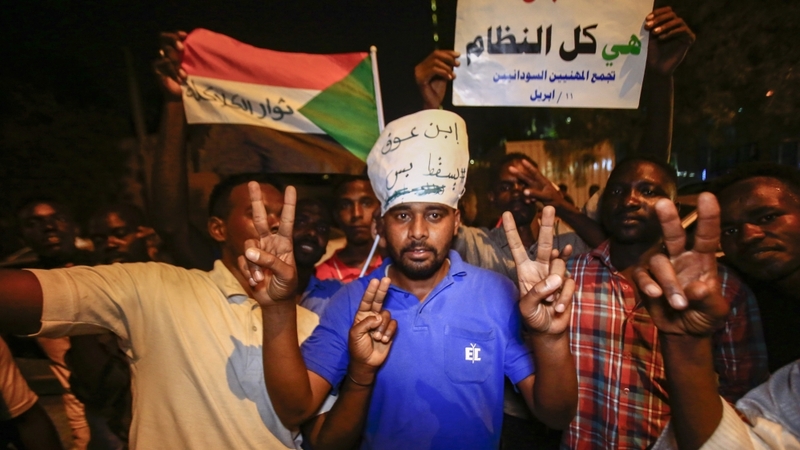 Sudan’s army warns it will enforce a night-time curfew, state media reports, as protesters vowed to continue demonstrating against a military council set up after al-Bashir’s removal. The curfew runs “from 10:00 pm to 4:00 am, and all must adhere to it for their own safety,” the army says in a statement carried by the official SUNA news agency. It adds it is “doing its duty to keep them [Sudanese people] and their properties secure”. Turkish President Recep Tayyip Erdogan says he hopes Sudan can overcome its upheaval peacefully through “national conciliation” and urges it to try to operate “a normal democratic process”. “My greatest hope is that Sudan overcomes this process through national conciliation and peacefully,” he says in the Turkish capital, Ankara. Separately, Jeremy Hunt, Britain’s foreign secretary, says two years of potential military rule in Sudan “is not the answer” for “real change” in the country. 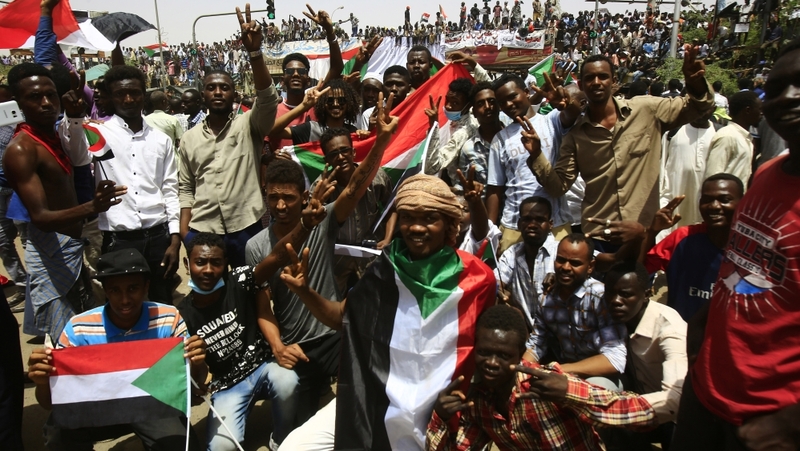 #Sudan‘s brave people have called for change, but it must be real change. A military council ruling for 2 years is not the answer. We need to see a swift move to an inclusive, representative, civilian leadership. And we need to ensure there’s no more violence. Antonio Guterres, UN secretary-general, is calling for an inclusive transition in Sudan that will meet the “democratic aspirations” of the country’s people. Organisers of the anti-al-Bashir protests are urging people to converge and join an ongoing sit-in that has been under way in Khartoum since the weekend.